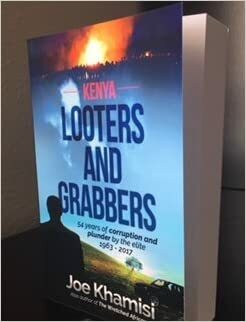 Posted on May 9, 2018, in Book Reviews, Five Stars and tagged 54 Years of Corruption and Plunder by the Elite, african, alibris, author, author life, authors, barnes and noble, book, book club, book geek, book lover, bookaholic, bookbaby, bookblogger, bookbub, bookhaul, bookhub, bookish, bookreads, books of instagram, booksbooksbooks, bookshelf, bookstagram, bookstagramer, bookwitty, bookworks, bookworm, britain, conspiracy, corruption, crime, culture, ebook, goodreads, government, history, ilovebooks, indiebooks, Joe Khamisi, kenya, kenyan, kindle, kobo, literature, Looters and Grabbers, nonfiction, nook, novel, paul manafort, political science, politics, publishing, read, reader, reading, shelfari, smashwords, sociology, story, trump, writer, writer community, writing. Bookmark the permalink. Leave a comment.